When he missed the cut at the U.S. Open for the first time in a major — his first tournament after his father died of cancer — some questioned whether he could rekindle his desire to dominate. He never finished worse than second in stroke play the rest of the season. Phil Mickelson emerged anew as a serious threat to Woods' domain by winning his second straight major at the Masters and nearly making it three in a row at the U.S. Open. Woods responded by winning the next two majors without breaking a sweat. While pleased to hear he had won the award, Woods was perplexed it did not go to his good friend Federer, who continues to dominate tennis. Woods was in Federer's box at Flushing Meadows when the Swiss star captured the U.S. Open. Federer actually has lost a few more than that, but not many. His record in 2006 was an amazing 92-5, including 12 singles titles. Woods received 260 points from sports editors around the country. Tomlinson, who already has set an NFL record of 31 touchdowns with one regular-season game left, was second with 230 points. Federer, who won three Grand Slam titles and lost in the final at the French Open, had 110 points. Rounding out the top five were Miami Heat guard Dwyane Wade (40 points) and St. Louis Cardinals slugger Albert Pujols (20 points). "Roger Federer is pretty sporty," Couples said. "Tomlinson is going to pound the record by I don't know how many TDs. It's all great. You would think if you're Roger Federer and you didn't win it this year, you don't know what else you could possibly do. But Tiger ... it's not like he's not deserving. He's winning 55 percent of the tournaments he plays. He's probably ahead of Shaq's free throw percentage." 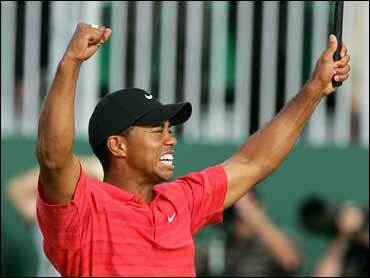 "Any time you're over 50 percent winning in our sport, it's probably a good year," Woods said. "I know how hard it is. I know what it takes to get to that point. I hate to say it, but people in the media and fans don't understand how hard it is. Players do. The things players have said to me over the years, that means a lot." Using driver only once on the crispy links of Royal Liverpool, Woods won by two shots to become the first player in 23 years with back-to-back wins at the British Open, and the lasting image of his season was Woods sobbing on the shoulder of his caddie, then his wife, realizing it was the first golf victory he couldn't share with his father. The rest of the year was a blur of trophies. He overpowered the field at the Buick Open, putted his best at the PGA Championship, outlasted Stewart Cink in a playoff at the Bridgestone Invitational, made two eagles in the first seven holes on his way to a 63 to overcome a three-shot deficit against Vijay Singh at the Deutsche Bank Championship, then won by eight shots at the American Express Championship. "It's hard for him when he wins four tournaments and no majors because people say, 'What in the world happened? That's when you realize how good he is."